What Do You Know about Myths? 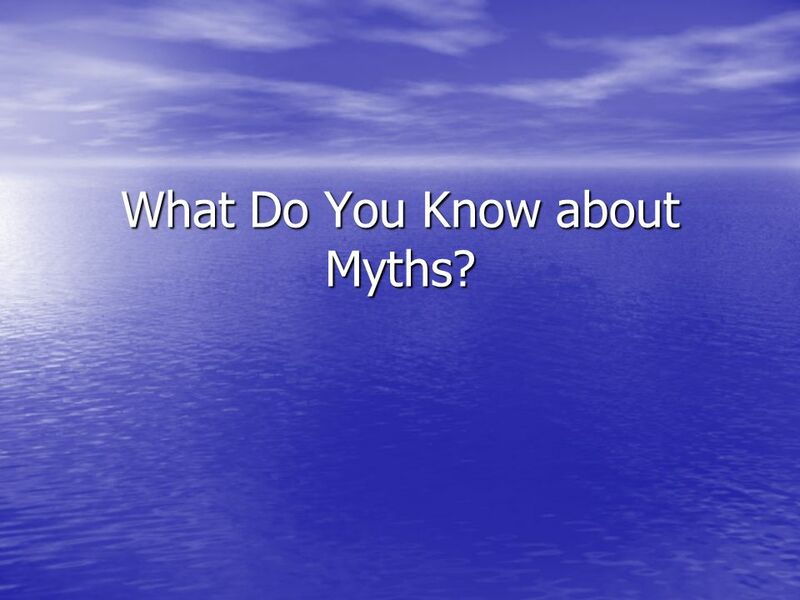 1 What Do You Know about Myths? 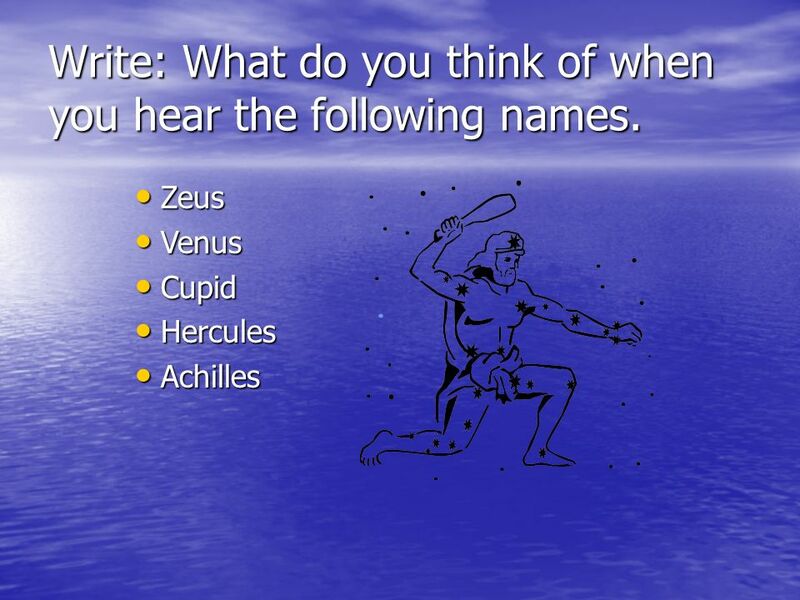 2 Write: What do you think of when you hear the following names. 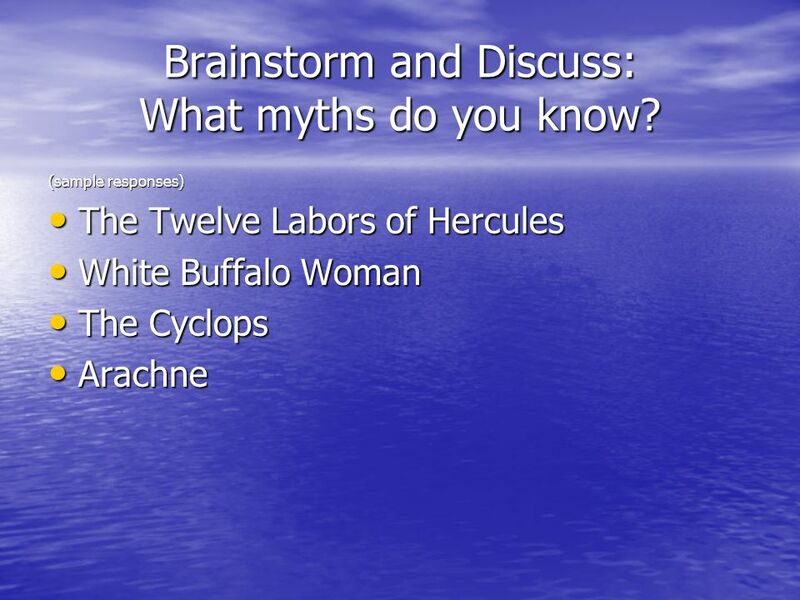 3 Brainstorm and Discuss: What myths do you know? 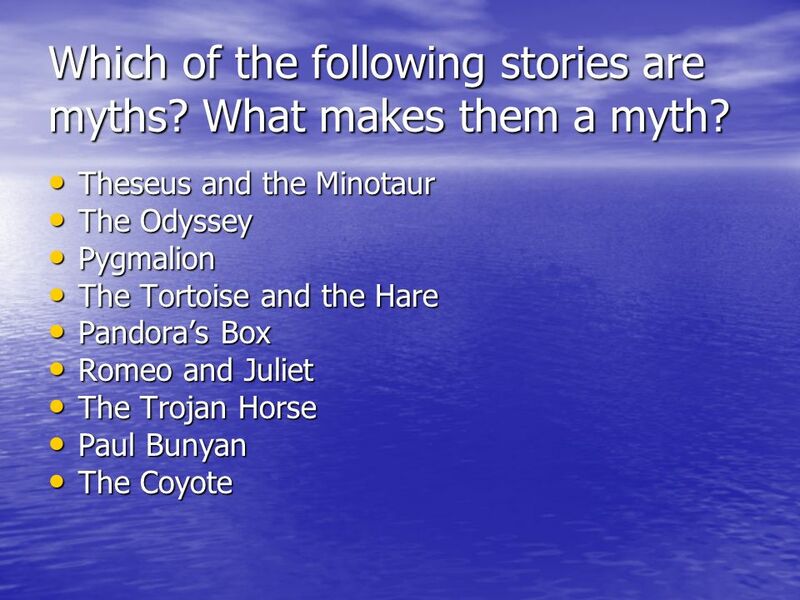 4 Which of the following stories are myths? What makes them a myth? 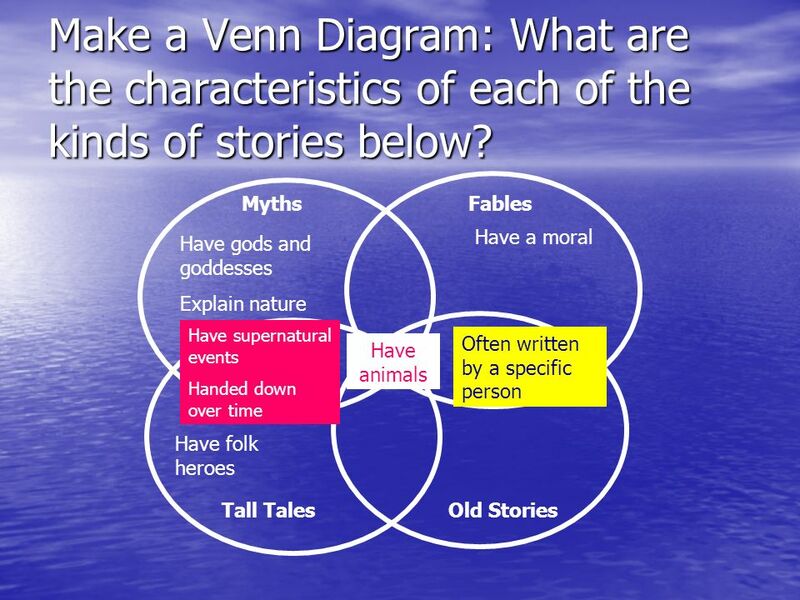 5 Make a Venn Diagram: What are the characteristics of each of the kinds of stories below? Why do people have myths? Why do different cultures have similar myths? Are myths important? 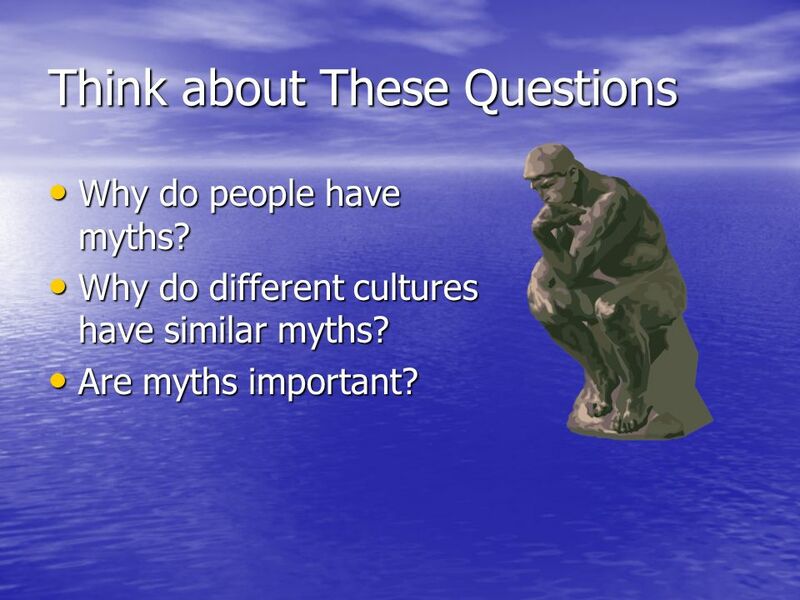 Download ppt "What Do You Know about Myths?" CClue #1 It has characters CClue #2 The tortuous and the hair. CClue #3 It usually teaches a lesson. GGenre- Fable. English- 7 th Grade.  to entertain  to preserve memories  to share wisdom and teach  Read the student experiences on page 650. Elements of Literature folktales. You will be learning about the following folktales: 1.Fables 2.Myths 3.Legends 4.Fairy tales 5.Tall tales. Gods and Goddesses The Creation of Mankind The Heros The Myths- True or False VocabularyWild Card $100$100$100$100$100$100 $200$200$200$200$200$200 $300$300$300$300$300$300. Fables Definition: A brief story that sets forth some pointed statement of truth Origin: Found in almost every country Handed down from generation to generation. Mythology is body of stories about gods and heroes that try to explain how the world works. Introduction to Folk Literature. Definition of Folk Literature Before writing, people were telling stories, reciting poetry, and singing songs about their. Unit Study Myths, Fables, Legends, Fairytales, and Folk Tales. Folk Literature Sometimes called folklore. Usually doesn’t have a single, identifiable author. Begins with oral tradition, not written down, so there may. Monday, October 17, 2011. Today’s Tasks 1. Warm-up 2. Myths and Creation Stories information 3. Pandora and Genesis 3 4. Greek Terms Review 5. Essay Checklist.